Winsted has a lot of wonderful restaurants, each with their own charm and specialty. One of the favorite hangouts for the Brew Crew is Rowley Grill and Tap, 19 Rowley Street, Winsted CT. Our first visit was strictly to check out their craft beer selection, and boy we were not disappointed. 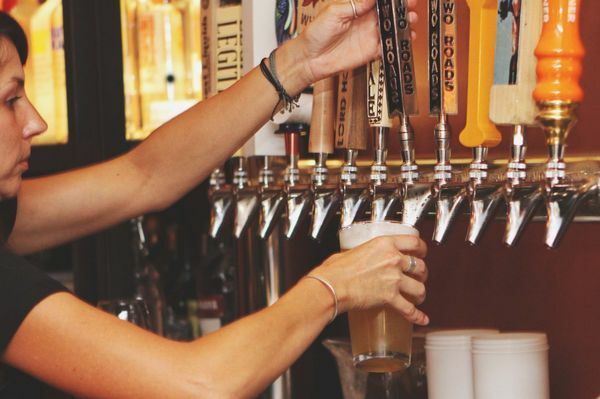 They have 12 craft beers on tap with the focus on the CT craft beer scene. We usually go for the beer but we keep returning for the food! Their Spicy Korean Gochujang chicken wings could very well be the best wings in the state. I do not even know what gochujang means, but if I had to guess it would be excellence in wings! The menu also offers many unique hamburger experiences. Fried egg on a burger, yes please! Want some Cajun flare, they got you covered. Beef brisket on a burger, they even make this dream come true! But in addition to burgers they have daily specials, salads and entrees that will create a party in your mouth! And as Brewers you know our favorite time of the day is happy hour Monday – Friday 3PM to 6PM. I hear they even carter, hmmm burgers at a brewery anyone??! !